The key difference between oomycetes and zygomycetes is that the oomycetes do not contain chitin on their cell walls instead they contain cellulose, beta glucans, and amino acid hydroxyproline while zygomycetes contain chitosan on their cell walls. Another difference between oomycetes and zygomycetes is that the vegetative state of oomycetes is diploid while the zygomycetes are haploid or dikaryotic. Oomycetes and zygomycetes are microscopic eukaryotic organisms. Oomycetes resemble true fungi. But they are water moulds. Zygomycetes are one major class of phylum Zygomycota which are true fungi. They are ubiquitous, saprophytic, environmental fungi. Oomycetes resemble fungi, even though they are not fungi. Earlier, they used to be known as lower fungi. However, more than fungi, they show characteristics similar to brown and golden algae and diatoms. Therefore, oomycetes are the water moulds, and they are filamentous. Furthermore, they are terrestrial and aquatic eukaryotic organisms. They obtain nutrients via absorption. Hence some are saprophytic while many are pathogenic. Cell walls of oomycetes have cellulose, beta glucans, and the amino acid hydroxyproline. Terrestrial oomycetes are parasites of vascular plants. They cause plant diseases such as root rot diseases of a wide range of plants, foliar diseases of many plants, seed rot and pre- and post-emergence seedling death, late blight of potato and tomato, stem rots of many plant species etc. Furthermore, the sexual reproduction of Oomycetes occurs via oogonia while asexual reproduction occurs by the formation of a structure called sporangia. 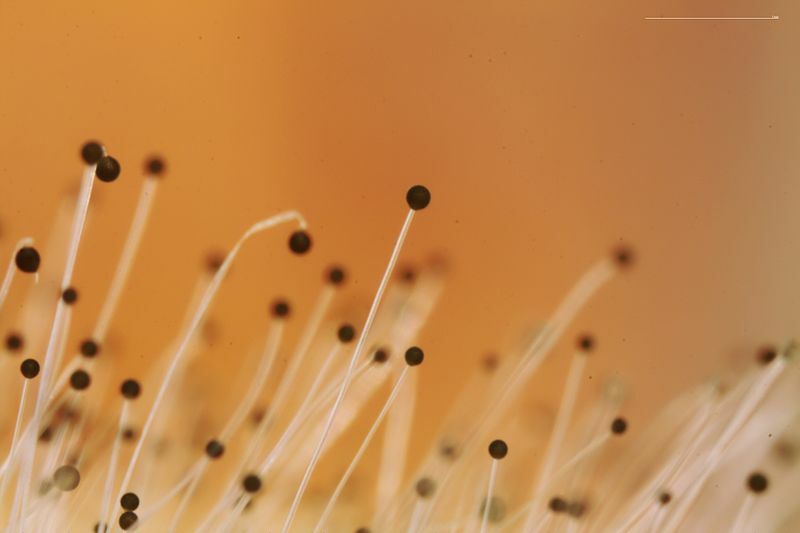 Zygomycetes is a diverse fungal class of phylum Zygomycota. They are ubiquitous environmental fungi. Moreover, the zygomycetes hyphae are coenocytic. However, during the gamete formation, septa can be seen. They belong to Kingdom fungi hence they are true fungi. Their cell wall contains chitosan. This feature makes them differ from other true fungi since they contain chitin in their cell walls. Moreover, these fungi depend on decaying materials. 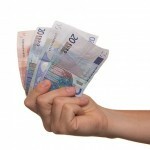 However, some are parasitic while another few are symbionts. 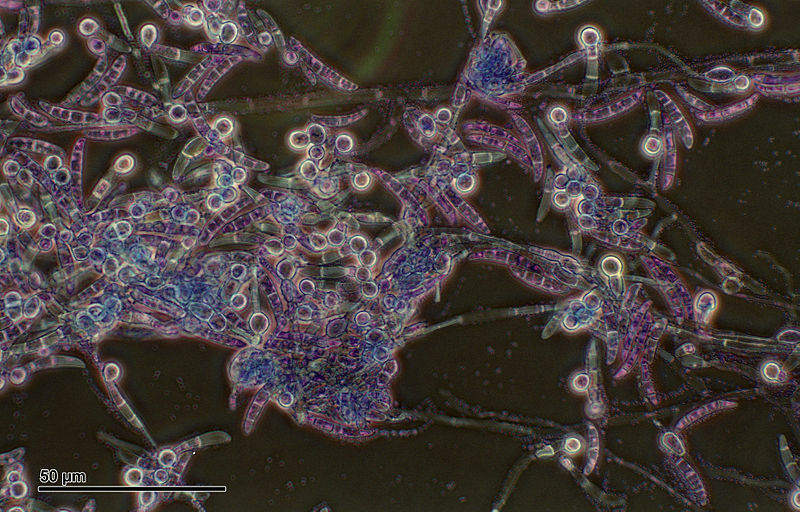 Mucor and Rhizopus are few members of zygomycetes. Zygomycetes reproduce sexually through zygospores and asexually as well. This class of fungi includes more than 800 species. Zygomycetes infections are rare. 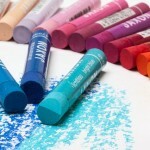 But zygomycosis is one of the diseases they cause, and it is difficult to treat. What are the Similarities Between Oomycetes and Zygomycetes? Oomycetes are referred to as lower fungi while zygomycetes are true fungi. Both are filamentous and microscopic. They are saprophytic or pathogenic. Both cause diseases to plants and animals. Some of oomycetes and zygomycetes are biocontrol agents. What is the Difference Between Oomycetes and Zygomycetes? In earlier classification oomycetes have been referred to as lower fungi since they are filamentous and have hyphae. However, they differ from fungi from several characteristics. Zygomycetes is a division of kingdom fungi including saprophytic, ubiquitous environmental fungi. Oomycetes have cellulose in their cell walls while zygomycetes have chitosan in their cell walls. This is the key difference between oomycetes and zygomycetes. 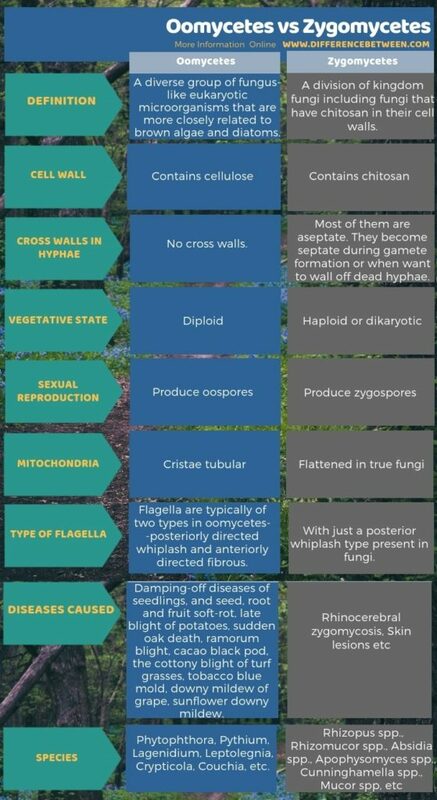 The below infographic presents more detailed ananlysis of the difference between oomycetes and zygomycetes. Oomycetes and zygomycetes are filamentous eukaryotic organisms. Oomycetes are a distinct group of organisms, which are closely related to brown and golden algae and diatoms. Zygomycetes are a division of true fungi. However, zygomycetes contain chitosan instead of chitin in their cell walls. Both oomycetes and zygomycetes have coenocytic hyphae. This is the difference between oomycetes and zygomycetes.